During the American fur trade era, the tradition of the mountain rendezvous was started by General William Ashley and the men in his company in 1825. The first rendezvous was simply a designated location to exchange pelts for supplies and reorganize trapping units. Between 1825 and 1840 seventeen annual rendezvous were held. Six of these were located at the confluence of the Green River and Horse Creek near present day Pinedale, Wyoming. In some years, total attendance at the rendezvous might exceed 2,000 individuals with Indians outnumbering the white trappers. Mountain man, James Beckwourth, described the festivities as a scene of "mirth, songs, dancing, shouting, trading, running, jumping, singing, racing, target-shooting, yarns, frolic, with all sorts of extravagances that white men or Indians could invent." An easterner gave his view: "mountain companies are all assembled on this season and make as crazy a set of men I ever saw." A favorite activity of the era was horse racing. A contest could be set by the slightest comment or brag. 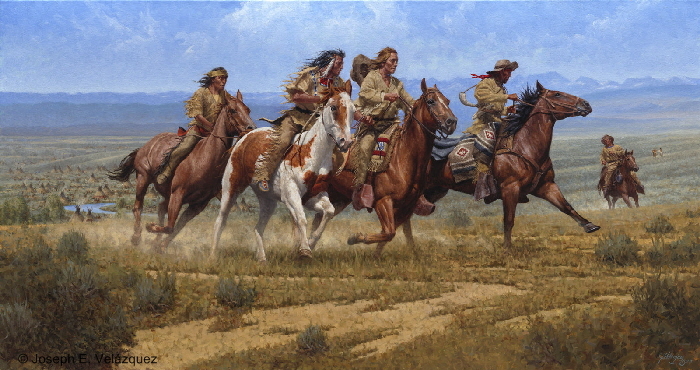 In this painting I have depicted a horse race with Indian lodges in the valley and the Wind River Mountains in the background. At the outcome of the race, many items of property would change hands.